I started blogging back in 2016. This was when I moved overseas to China and wanted to document my travels, as well as share about it with friends and family. At the time, I knew nothing about blogging and didn’t really care. I just wanted a place I could express myself, remember my thoughts & feeling as well as share it with people I care about. I also had a different website and no real clear direction. I have since settled on my niche and am continually refining it. Currently, I blog about travel & holistic health. Along with that, I am now helping others learn how to create their own income online. Driving traffic & monetizing my blog is something I have only just begun in the last few weeks. I may be new to this but I am super proud to say that in the last month I have increase my blog traffic by 250%!! Today everyone and their mother (or dog) seems to have a blog. There are many well established blogs in every niche you can think of. Don’t let this hinder you in thinking that there is no room for you. Maybe there is more competition, but there is also more demand for digital marketing, affiliate marketing & a continually increasing online presence. It’s almost the start of the new year and a perfect time to dive into something new. 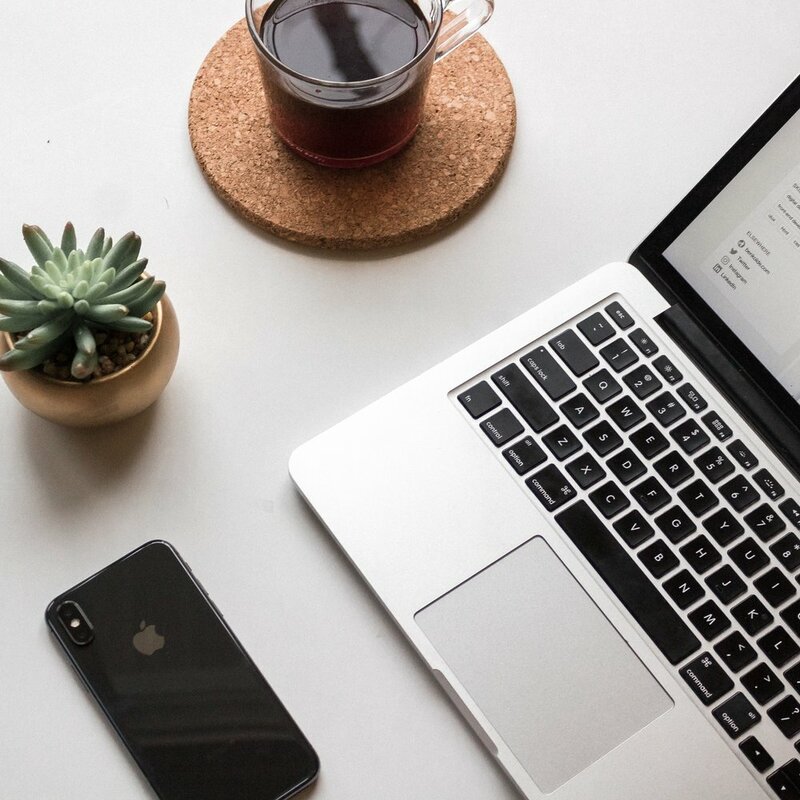 If you have thought about starting a blog or like the idea of having another source of income, this is the perfect time. If you don’t care about the income part, thats ok too. You can also do it as a hobby, to spread inspiration. If you already have a blog, but want to learn ways to monetize or increase traffic, I have your back on that too. OR if you have a business of any kind, these can be helpful to you as well in growing your business. 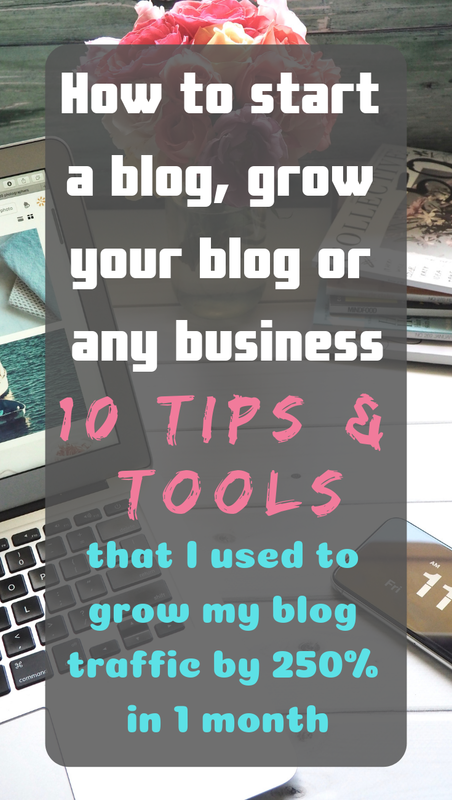 Here are 10 ways to help you start and/or grow your blog or business. This is the essential first step. You must set up a website, a place to put your blog entries & where people can come to. Wordpress is by far the best program to use in creating your blog. I currently use Squarespace. Squarespace is more user friendly and I would recommend it if you do not have intentions of growth, if you are creating you are creating your blog for more personal reasons. I have also used Wordpress and now I realize why everyone buzzes about it. It can take a bit more of a learning curve technically but I was able to figure it out. Also there is awesome online support if you get stuck with anything. You can google or youtube help as well. This will let you add all the fancy plugins and it has the best design. I am looking to switch back soon. The next step in this is creating a domain, this is where you register the name and get the rights to your website. It is low cost and important if you want to really get people interested. My domain, for example, is www.nourishthefreelife.com, prior to this it was www.nourishthefreelife.squarespace.com. You can tell which one looks more professional and appealing. This is a super easy step and worth the money. You can also use these programs for any business website. Below are your links to get started on both. Whether you just want to share with family and friends or you want to monetize your blog. Social Media is a good place to start getting it out there or promoting your business. Using Instagram & Facebook are a good way to let people know about new posts and what your blog is all about. You can share links individually or if you have a brand for you blog, make a facebook page and/or group to really get the information out there to people who are interested. Put your website link in your instagram profile as well. To really drive traffic from these two platforms you need to be present on them and share valuable content. This is personally not my main priority at this time but I still share my new posts here and get a fair amount of traffic from them. Now that I have also creating a good following on Instagram that has helped me, it drives traffic but more so with collaborations with companies and other people. I will touch more on that later. This is another social media platform, but for blogging it needs its own step. Pinterest is THE reason that I have been able to increase my traffic like I have. I have also taken my Pinterest from 5k monthly views to over 23k monthly views in a few short works. It has been done with minimal effort and just a little bit of learning. Firstly I took the below course by Elldulces of Boss Girl Bloggers. It was only $10 and so worth it to really learn some of the easy ins and outs to up your Pinterest game. Tailwind is also my new best friend. It is a separate website that allows you to schedule Pins, get more shares of your Pins through joining Tribes in your niche and understand your statistics to be more successful. Tailwind has a free trail to try it out but I am sure by the end of the month you will see how great it is and sign up. You can also use tailwind to schedule instagram posts. I have not gotten into that yet, but plan to use that tool as well. This is super great for any kind of business you are looking to promote, whether your business is local or fully digital. I love Canva! It makes it so easy to create any great things for your business. I created my logo and I use this to create my beautiful pins that I use to promote my posts on Pinterest. This is how you capture the attention of people through Pinterest. If you think of what makes you click on things on Pinterest its usually because something stands out to you. I know for me, I usually open Pinterest for something specific but end up clicking on a million things that popped out to me. Or truthfully I am guilty of just opening and looking out of boredom. This is why it is important to also make the pins you post, pop. Canva already has the perfect size pin to start creating. They also have great free photos, ones you can buy or upload our own. Use bright colors, eye catching fonts & choose your wording wisely. You will learn more details about how to use Pinterest, create pins and use important keywords in the course by EllDulces. Another note about this course is it is super simple step by step, I knocked it out in a day but refer back to it often. Here is another great way to grow your blog or any online business, ConvertKit. This tool will allow you to let your audience subscribe to your blog or website. Email may seem like an old school thing of the past, but really it is alive and well. Email marketing really does work! There are so many ways you can utilize it. It is the perfect way to let people know you have a new blog post, alert them about new products or promote a sale for you business. Really you can send out any information you want to get across to those people who gave you their email. Also, it's important to note that these are people who chose to sign up with you, whether it's your blog or business. There was something that peaked their interest. This group of subscribers are much more likely to check out what you are saying, then just throwing it out there to whoever on social media. Both can bring results but an email list is essential to ultimate success. ConvertKit is the best and easiest to use. You can also create landing pages and funnels. If you don’t know what those are they are pages you can generate to attract people to a certain product, service or promotion while also capturing and email. It’s a page you will get a link to that you can drive traffic from the places listed above. You can learn more about what ConvertKit has to offer and sign up for yourself below. Affiliate marketing is when you get paid by a company in commission for either driving traffic to them or a percentage of the sale generated by your referral. You are given a unique link that you can share with others how you choose. This is how many bloggers really make the majority of their money, among other things. You can also use Affiliate marketing with your business to generate another flow of income. You don’t to just sign up and promote anything. Make sure you choose wisely that whatever it is your promoting also aligns with your business or blog niche. If you have a company, brand or product you want to promote and are not sure if they have one, simply google “company + affiliate program.” Usually they are free to register, though you may need to wait a couple days for approval. Then you are given your unique link and can start earning. Most programs also have a dashboard you login to to see how many clicks you get and that allow you to see your sales. A popular and easy to use program to find companies to work with is called ShareASale which is free to register at the link below. Again, you can also just google individually to see if a particular company accepts affiliates. This is a great way to get yourself out there, drive more traffic to your website and sometimes even earn extra money. I have just recently started collaborating with others to help get my name out there. I have done two guest blog posts so far on other blogs. This is an awesome way to gain more of an audience authentically. 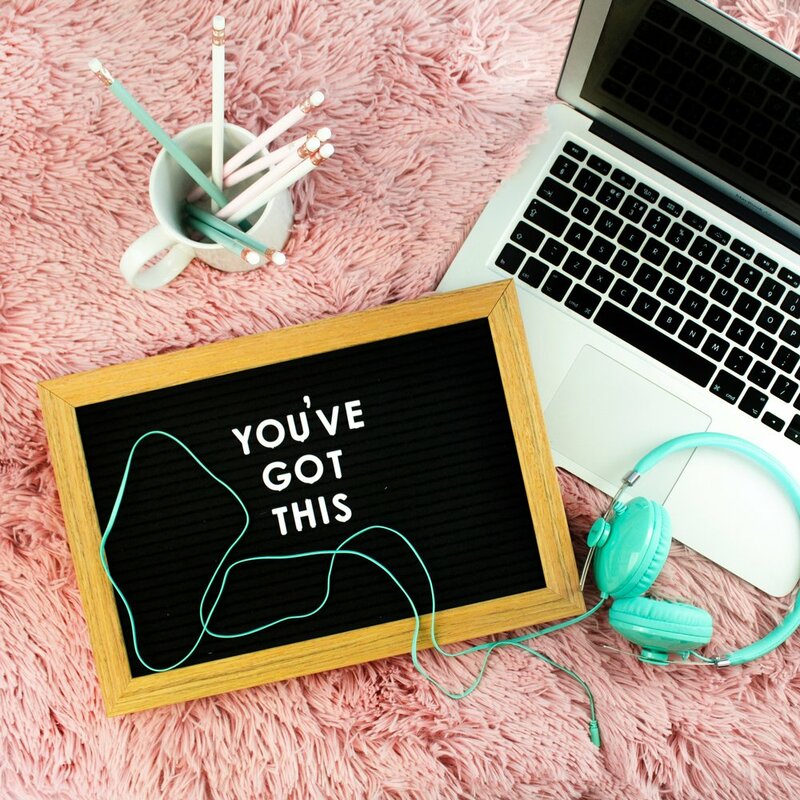 You should not be afraid to do this for people in your same niche, especially if you are sharing an article with a blog that gets much more traffic than yours. Just make sure you are getting full credit for what you have written and that they include links to your blog & social media platforms. Collaborations can also be done with businesses, both paid and for free product. This is something I have just recently started to dip into. I am in talks with companies to review & write about their product through a blog post and/or post about it on instagram. A note on this is to not just take anything that is thrown your way. Make sure that what you are promoting aligns with your purpose, brand and is something you would actually use. I can’t stress enough the importance of being authentic. This is an area that I strive to work on and become better myself, appearing authentic through my brand & business I am promoting. If you do start a blog, it is your business so treat it that way. These simple tools & ideas can be a game changer in your business really taking off that you have only dreamed out. Blogs and any business for that matter, do not just sit there and gain success. You must be willing to put in some work, a little investment and have your heart in it. All the best my friends, I wish you all the success you are dreaming of!